Senior official rebuffs British claims Iran's stance towards Israel has softened. 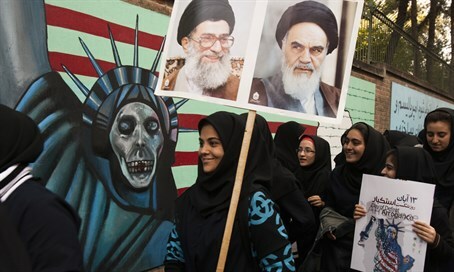 A senior Iranian official has reiterated that Iran views the annihilation of the State of Israel as its most central foreign policy, despite warming relations with western powers. The Iranian Parliament Speaker's Adviser for International Affairs, Hossein Sheikholeslam, made the comments in a speech to reporters in Tehran, during which he also attacked the British Foreign Secretary for suggesting Iran's hostility towards Israel had softened since the nuclear deal. "Our positions against the usurper Zionist regime have not changed at all; Israel should be annihilated and this is our ultimate slogan," Sheikholeslam said Tuesday, according to the semi-official Fars News. He was responding to an interview given by UK Foreign Secretary Phillip Hammond following the reopening of the British embassy in Tehran, during which Hammond claimed the current Iranian regime was displaying a "more nuanced" approach towards the Jewish state than previous ones. "What we're looking for is behavior from Iran, not only towards Israel but towards other players in the region, that slowly rebuilds their sense that Iran is not a threat to them," Hammond added. Sheikholeslam also rebuffed Hammond's call for past hostilities between Iran and Britain to be forgotten, retorting that Iran ""will never forget the past and Britain's colonialist moves."